Blessings, Miracles, &Thoughts in Between: Rodan+Fields - Review & Giveaway!! I'm sure many of y'all can relate to the insanity that is the postpartum body. Hair falling out. Baby bangs growing in. Things sagging. Things shifting. Break outs. Oily skin one day. Dry skin the next. Having children is such an amazing blessing. It truly is a miracle. But y'all. My sweet boy I birthed nearly 11 months ago (hold me - how is he almost one) has done a number on my body. Specifically my skin. I've always have problem free skin. Never dealt with acne, breakouts, etc. And I managed to have nearly perfect skin with little to no work. Yep. I was that girl that did not so much as wash her makeup off at night and managed to still have wonderful skin. Not anymore! Whether it be two babies in less than two years, getting closer to the big 3-0, or all of my poor skin care routines in the past, I'll never know. But I do know one thing. My skin is not what it used to be. I am battling breakouts, a ridiculously oily t-zone, and dry patches on my cheeks. It is not pretty. A few months ago I started to hear people talking about Rodan+Fields. Around that same time, one of my precious blog readers Lindsay emailed me asking if I would be interested in testing out a few Rodan+Fields products as well as host a giveaway for all of my readers.Yes Ma'am! Sign me up! Lindsay's email was the push I needed to start caring about my skin! After a few emails with Lindsay, I decided to take some time to learn about this new company and skin care line. Lindsay and I have so much in common. Not only do we share the same name, but we are both from the amazing city of New Orleans, currently call Texas home, are the proud mommas of strong willed toddlers, and love smocked clothing! Rodan+Fields is a BOOMING direct sales business and Lindsay has capitalized on this amazing opportunity! 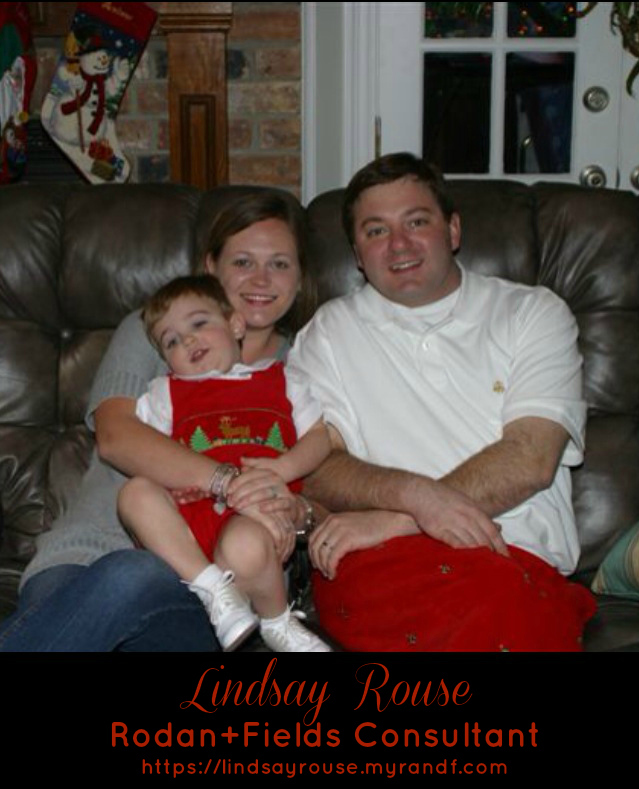 Within 6 months of joining the Roden+Fields family, Lindsay will completely replaced her full time teaching salary! Working from home! What an amazing blessing this company can be! Rodan+Fields is a skincare line from the same Doctors that created Proactiv. Dr. Katy Rodan and Dr. Kathy Fields realized they wanted to help people have amazing skin no matter what age. These products were the top selling clinical skin care line in Nordstrom until Rodan+Fields made the change to a direct sales business model. All products come with a 60 day money back guarantee! You know something is good when they will give you your money back if you are not satisfied! There are so many different skin care lines in the Rodan+Fields family - Soothe for sensitive skin, Unblemish for adult ache, Reverse for sun damage/ dark spots, and Redefine for reducing signs of aging. After discussing my skin issues with Lindsay, she recommended I use the Unblemish regime to help clear up my problem skin. I've been using Rodan+Fields Unblemish for over a month now and I cannot even being to explain how awesome my skin looks and feels! My breakouts are completely under control. My skin looks healthy. But most importantly? I finally feel confident in the way I look without makeup! I cannot even count how many times within the past few weeks I have confidently left the house with just mascara and lip gloss! I have finally realized the benefit of taking care of my skin and I am so thankful that Lindsay, and her new business, pushed me to this realization! 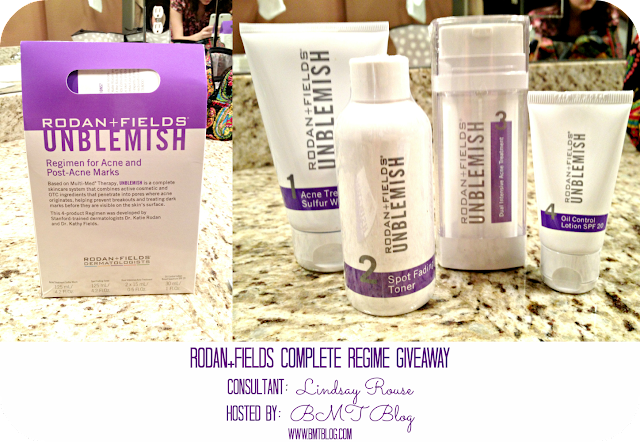 Lindsay has generously decided to give one of my readers a complete Rodan+Fields skin care regime! This is worth more than $100 and I am so excited to have the opportunity to share this amazing product and company with y'all! You can enter this giveaway below, via Rafflecopter! UPDATE: Just heard from Lindsay and she has added SEVERAL awesome offers for my readers via this giveaway! From Lindsay: The other great news is I am covering the cost of any new Preferred Customer ($20 value) that signs on via this blog- 10% savings and free shipping. Not bad at all. Oh and if you email me- lindsayrouse@gmail.com to find out more about the business, you get a complimentary mini-facial! I would get the unblemish regimen. I just turned 30 and out of no where I'm breaking out! Never had that problem before! I would get the Redefine Regimen! I would love to win this! I have dealt with problematic skin since having my little boy, too! Unblemish for sure! Like you I had two babies in a two years and my skin is horrible now! I have been thinking of trying Unblemish because I've always battled acne prone skin. Hoping this is the answer! I would love a chance to try this! bannank at gmail dot com. I have heard so many wonderful things about the Reverse line! I would love to try it out. The reverse regimen would definitely be for me! The reverse one would be perfect for me! I'd like to try the Redefine! Would love to win the unblemish! I would like to try the redefine regimen. I would love smaller pores and less lines! I'd like to try Redefine regimen. I tried their microderm mini sample and LOVED it! I'd love to try the sensitive care regemin. Totally would reverse---darn you cheap Starkville tanning salons in college! I would get the Unblemish System. I've been dying to try this! I want to try their Reverse line! I'd like to try the Unblemish line! Unblemish, to clear up my skin. Thanks for the giveaway! I'd get the unblemished one! I'd love to try to reverse! I would love to try Unblemish. The other great news is I am covering the cost of any new Preferred Customer ($20 value) that signs on via this blog- 10% savings and free shipping. Not bad at all. Oh and if you email me- lindsayrouse@gmail.com to find out more about the business, you get a complimentary mini-facial! I've heard great things from a few people and would love to try it! I would love to try the unblemish! I want the redefine system! i, like you, want to do the "unblemish." thanks!! Would love to try Redefine! Geez, thought I was done with breakouts.... Then two kids in two years has done it to me too, Lindsay! Been wondering about the Unblemish product ever since I heard R&F came out with some new formulas. Thanks for the review.